Philip Lloyd of Bristol Longcase Mahogany Circa 1780 - Height 89.5in. 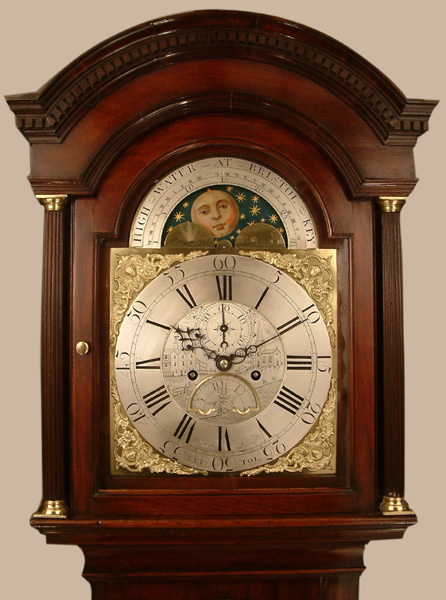 This Longcase Mahogany's Maker - Philip Lloyd of Bristol. Came from Llawhaden in Pembrokeshire to Bristol in 1775. He is recorded a�?Most of his clocks are in first quality mahogany cases with moon and tidal dials.He also made astronomical and other complicated clocksa�?. A highly rated maker, recorded Bristol 1775 a�" 1785. Typical late 18C high quality Bristol mahogany case with breakarch top, dentil moulding under, brass capped, fluted hood columns and side windows to hood. Long trunk door with shaped top, canted fluted corners to trunk and base.Raised base panel following the shape of the trunk door top. Bracket feet. 12" breakarch brass dial having moonphases to arch and High Water at Bristol Key. 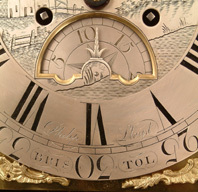 The dial centre and date lunette finely engraved and silvered. Subsidiary seconds dial. Blued cut steel hands. Good quality 4 pillar movement with hourly ( rack ) striking and pull hour repeat. Philip Lloyd of Bristol. Came from Llawhaden in Pembrokeshire to Bristol in 1775. 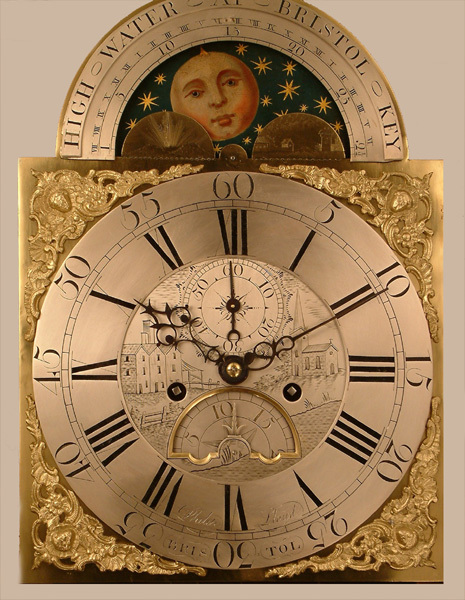 He is recorded a�?Most of his clocks are in first quality mahogany cases with moon and tidal dials.He also made astronomical and other complicated clocksa�?. A highly rated maker, recorded Bristol 1775 a�" 1785. 89.5" ( 227.3 cms. ).